now to book by phone. Vacations can be pricey. You pay money to get there, to sleep there, and to eat there. On top of that, you want to enjoy your time, so you end up having to shell out cash for activities while you’re there. If you’re looking for a budget vacation in San Diego, look no further. Here are the best things to do under $20 in San Diego! If you’re looking for a little peace and quiet, try fishing while you’re in San Diego. The weather is often perfect for any outdoor activity year-round, and there’s no fishing license required. Halfway down the Oceanside pier, there’s a Bait & Tackle shop where you can rent all of the equipment you need. Spend a morning or afternoon taking in all San Diego’s scenery has to offer (and potentially catch dinner!). Balboa Park is a cultural haven in the city of San Diego. The spot includes museums, hikes, architecture, and just a spot to sit and relax for each and every visitor. If you’re sick of the beach, but still want to enjoy some sun, then this is a great place to go. You can launch on the lawns or sit on the park benches while learning more about the gorgeous plants that inhabit San Diego. On your next visit to San Diego, skip SeaWorld and see wildlife in its natural habitat. The seals of San Diego are located in La Jolla, just 20 minutes up the coast. These seals lounge on the rocks all day sunning themselves. If you catch them in a more active state, then you may see some diving and swimming too. Once you’re at La Jolla Cove, you may decide you want to invest in some other costlier things to do like snorkeling or scuba diving. Regardless of what you decide to do, just remember that the seals are wild animals and it’s always better to keep a safe distance. This is notthe same as taking your kids to a petting zoo. If you’re ocean-obsessed then this is another fabulous way to get you out on the water. The ferry may not be a Yacht or a Disney cruise, but it’s still an enjoyable way to see San Diego. You can take the ferry from the San Diego Harbor to Coronado Island. Round-trip will cost you right around $5. There’s a variety of departing and arriving ferries, so you can also take the time to explore Coronado Island if you so please. Potato Chip Rock is one of the most photographed spots in the country. The rock juts out just like a potato chip, and it’s a wonder it’s still standing after all the people crowding on for a photo op. Because it’s free, put this one on your list for early in the day. The trails do become increasingly more congested. The Pacific Beach Boardwalk is one of the most enjoyable boardwalks in the United States. Plopped right on the water sandwiched between sandwich shops, bars, and the water, there is a million things to do and look at. You can walk from Mission Bay all the way through Pacific beach and keep going if you’re so inclined. You can easily kill a few hours and if you’re in San Diego, it is a must. Though San Diego is largely considered a beach city, the clubs that dominate 5th, the main hub of downtown, still require their patrons to abide by a dress code that could be considered similar to that of Las Vegas nightclubs. 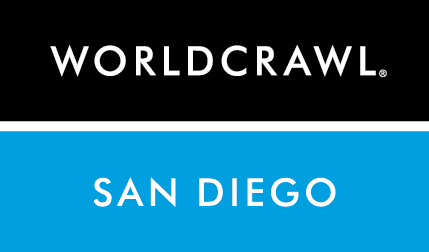 What Does World Crawl Do? We do all the work for ou when you come to a new city. Don’t worry about deciding which bar, club or party to attend, we have it figured out. Copyright © 2009—2019 World Crawl – All Rights Reserved.